St Jane Frances was born in Dijon, France. She was the daughter of the President of the Burgundy Parliment. At 20, she married a Baron and they lived in the Castle of Bourbilly. At 28, St Jane was widowed with four children when her husband was killed in a hunting accident. Soon afterwards, her mother, step-mother, sister and her first two children also died. 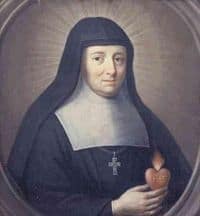 St Jane Frances, with Francis de Sales as her spiritual director, then took a vow of chastity and set up the Congregation of the Visitation in Annecy. She accepted women into the Order who had been rejected by others. The Congregation was also unusual for its community outreach work, rather than the Sisters remaining in a cloistered Convent. The Congregation flourished under St Jane Frances’ leadership and at the time of her death, the number of houses had reached 86. St Jane Frances outlived all but one of her daughters. St Jane Frances’ Feast Day is the 12th August. She is the Patron Saint of widows and family conflict. Pray for us who are burdened with family grievances. Help us to place our entire trust in the Risen Jesus.